The Star Wars is a famous movie which is liked by the viewers. 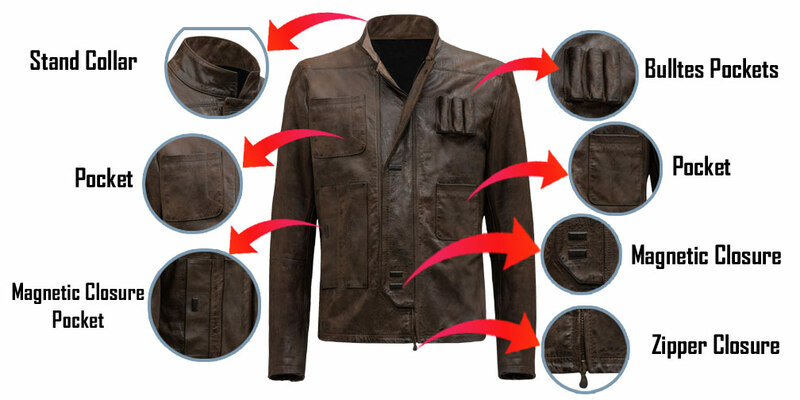 The Han Solo Jacket is made from 100% cowhide leather or faux leather which is long lasting. Once you purchase it and wear for long years. The jacket is worn by the super hero Harrison Ford. The stand up collar of the Han Solo Jacket makes your personality outstanding. The magnetic front closure is the unique feature of the jacket. You will also found multiple front pockets. The ammunition holders of the Han Solo Leather Jacket on the left chest also look stunning. The YKK branded zip is used for the front closure The sleeves are long and have zipper cuffs which offer you easy wearing. The Han Solo Leather Jacket has durable inner lining. The detail stitching has made it very popular.